Caprissimo is the newest creation by Carthusia which successfully captures the feeling of Capri’s la dolce vita. Centred on the lemon tree, Caprissimo interprets the hesperidic and sparkling notes of this exotic Mediterranean isle. Piquant notes and subtle green accents pave the way to a floral heart of blue jasmine, frangipani and osmanthus. Caprissimo is wonderfully rounded off by intense notes of wood and exotic myrrh. 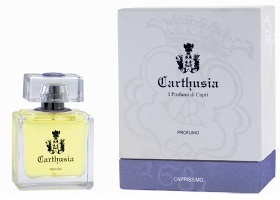 Carthusia Caprissimo is available now at First in Fragrance in Germany, 75€ for 100 ml Eau de Toilette. (via firstinfragrance, additional information via extrait.it) It will reportedly also be available in 50 ml Eau de Toilette and 50 ml Parfum. Note that Carthusia had an older fragrance called Caprissimo that was apparently only available in the brand's shop on Capri; I do not know if this new one has any relation to the old. There’s been so much good (or bad) news this week…my list is expanding too! The ever-growing list, I know! Sigh. I’ll never catch up. Just this week I was telling myself that I HAVE to stop sampling for awhile and just enjoy things I own. I do have one advantage, now that you mention it. I don’t write down ones I mean to try, and I have a horrible memory. So unless I come across them while ordering samples, I don’t remember they exist. LOL…your memory sounds like my memory. Whew, I thought it was only me! Bet you a dollar that Mals has it all on a spreadsheet somewhere…she’s got to be the most organized person I know! I was going to mention that, E… I don’t keep a written list of things I want to try. If they stick in my memory (and unfortunately, I have a GOOD memory) I may eventually get a sample. However, some samples are ordered almost instantly and others end up waiting months or over a year before I remember I “need” to have them. LoL, Joe! I keep a small notebook by the computer and write down things I want to try. Like you, some things get ordered almost immediately, but other things have languished on the list for a year or more. I find if that happens, I’ve lost interest. Oh, dear, looks like something I have to try. Darn, they’re so spendy. Really loved their Mediterraneo, though. What everyone else said. Sounds great. Must try. Need more money. Blah blah blah. What the heck is blue jasmine though? Don’t think I’ve heard that before. I still very much want to sample Mediterraneo. I’ve probably tried about 5 times to snag a sample from Aedes… they’re always “out”. Hrmph. I wonder if Mediterraneo has been reformulated? I’m scared to try it again. Luckily still have a half-full bottle. Finally got a sample and…my daughter said “it smells like that cleaning stuff, you know…like Lysol!” And I’m afraid she was right. I don’t even normally have that reaction w/lemon scents. Oh dear. Well, I understand even AG Hadrien is ruined now that it’s compliant w/ the new IFRA restrictions on citrus. I guess it was too much to hope that Mediterraneo would stay the same. “What everyone else said. Sounds great. Must try. Need more money. Blah blah blah.” This could be my bumper sticker…. At first glance, “centered on the lemon tree” made me think this would be a very close cousin of Mediterraneo (which I too love), but then I read the floral heart and intense base notes and it started sounding significantly different. This sounds intriguing enough to go on my to-try list. Great minds think alike! But it does sound more like a floral…I think the original scent was advertised as having “25 flowers”, or else I’m confusing it with something else. I have a bottle of the original from the shop in Capri and it was described in the accompanying leaflet as having  (I can’t remember the number exactly but it sounds about right) flowers. It didn’t give any more information than that. The notes of the new one don’t sound anything like mine smells which is a rich “perfumey” floral. And based on the sample of this I just received, I’d say the note listing and description are misleading. This smells like a rich perfumey floral. In fact, I’d say it smells a lot like the older Guerlains. I had to come back and look up the notes, because this wasn’t at all what I expected, to the point that I wondered if they’d mixed up the samples. Still a possibility, of course. This is not a line I’ve tried anything from (so many ‘fumes, so little time and money!). But I really, really want to go to their shop on Capri to try them. Take me! I’m almost small enough to fit in a suitcase, if a little on the heavy side to carry. I’ve only tried IO Capri, and need to try it again..couldn’t quite decide one way or the other. I like it, but don’t think I love it…but then again maybe… it was one of those. Doesn’t that kind yes/no/maybe/no/yes scent drive you crazy?? It would, but I just toss it aside and move on to the next one. I’ll circle back eventually, and maybe it will make itself more clear. LOL…yes, I’d like that too!